The 2014 Senior Season is getting closer with the league today releasing the 13 Week schedule for Division 1. The Warriors will open their season in the Vicbowl rematch against the Buccaneers whilst the Barbarians will take on the Northern Raiders. The Monash Warriors have been into their Preseason for 2 weeks now and the numbers are looking strong. With a fresh group of Rookies, some new recruits and almost no changes to both teams, the Warriors look even stronger than they have in recent years. 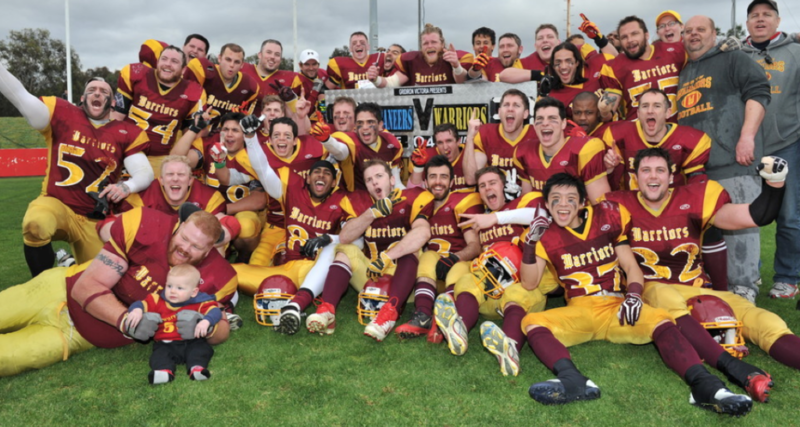 Gridiron Victoria’s top division has extended from 5 teams to 10 in the offseason and the Warriors will need to keep improving in order to win their second Three-Peat, a feat they were able to accomplish in 2008 – 2010. Whilst more teams means more competition, a game everyone will be keeping their eye on is the Warriors v Barbarians battle as the Barbarians are one of the five teams to have entered the top division. The Barbarians were originally created to be a ‘Reserves’ team for players that couldn’t train or couldn’t make too many games throughout the season. The Barbarians have been one of the best teams in Division 2, taking out the Div II Championship last year and losing that same game to the Royals in the season prior. In 2014, the Barbarians have moved up and will look to continue to improve even further. 2014 shapes to be an exciting year, one definitely to be a part of. Anyone interested in joining should get down to Monash University in Clayton from 10AM to 1PM Sundays. It is not too late to join, no experience required and everybody is welcome!